Free Shipping Included! Ingenuity Boutique Collection Smart and Simple Playard - Bella Teddy by Ingenuity at Baby Bouncers & Swings. MPN: 11167-1-NA. Hurry! Limited time offer. Offer valid only while supplies last. Designed with parenthood in mind. Wash only what you need! The Smart and Simple Boutique Playard in Bella Teddy is every mother's dream come true. Designed with parenthood in mind. Wash only what you need! The Smart and Simple Boutique Playard in Bella Teddy is every mother's dream come true. gorgeous premium fabrics that are machine-washable! The Dream Centre is the perfect place for new-borns to rest or play thanks to soft fabrics, breathable mesh and a toy bar with two adorable toys. The modern and neutral colour of the Bella Teddy fashion suits boys or girls and looks great in any home. The Just Right Height elevated changing table makes diaper changes more comfortable for both you and baby, and it flips easily out of the way when not in use. Side storage pockets help keep you organized and all baby's needs within reach. All the washable pieces, Dream Centre, mattress and changing pad can be removed in minutes to go into your washing machine to keep baby's environment clean and stain-free. 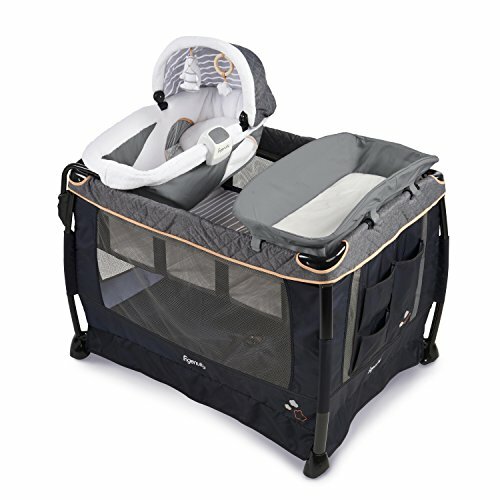 OneLessStep feature means this playard folds fast (without removing the bassinet) to make transport easier on you. Travel bag included.